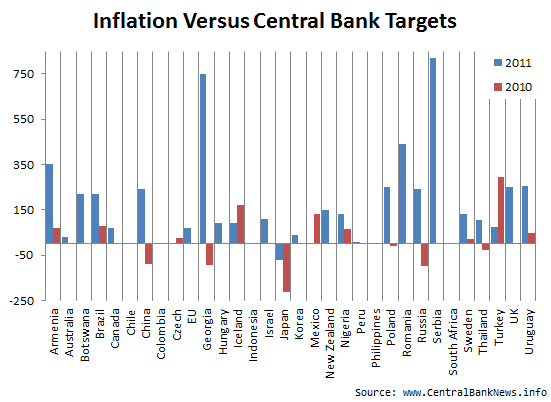 This report outlines where inflation is tracking in countries where the central bank has an inflation target. 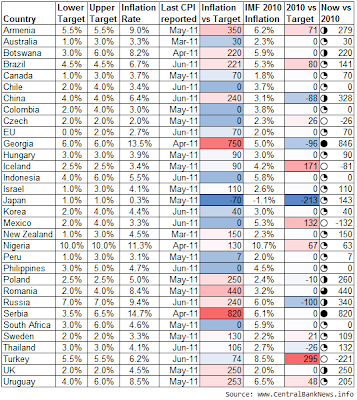 Central Bank News has compiled a table of countries/central banks that have publicly announced an official inflation target. In some cases the target is a government target, but in many cases it is one of the central bank's key performance indicators. 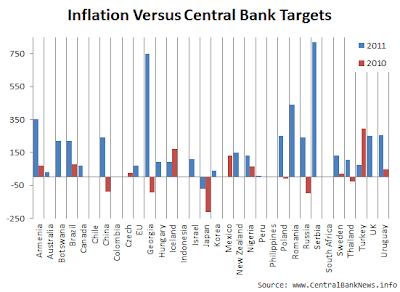 Of the 32 countries that Central Bank News is monitoring, which have inflation targets; 24 last reported inflation above target, 1 had inflation below target, and 7 reported inflation within their target range. Note, the inflation figures in the table below are all on a headline, or gross, inflation basis. 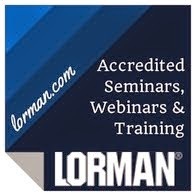 What will inflation vs target be in 2012? Of those that saw inflation above target, the standouts were Serbia (14.7% in April-11 vs target range 3.5-6.5%), Georgia (13.5% in April-11 vs target of 6%), Romania (8.4% in May-11 vs target range 2-4%), and Armenia (9% in May-11 vs target 5.5%). Below target was Japan (0.3% in May-11 vs target 1%), which only just emerged from deflation on a headline inflation basis. 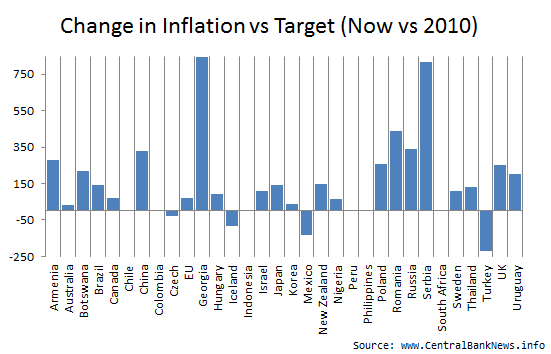 Of the 7 countries with inflation at target, or within their target range, 5 were also on target at the end of 2010, while 2 were above target. The chart below shows the change in inflation versus target, between the most recently reported inflation figures and the end of 2010 inflation figures (from the IMF). 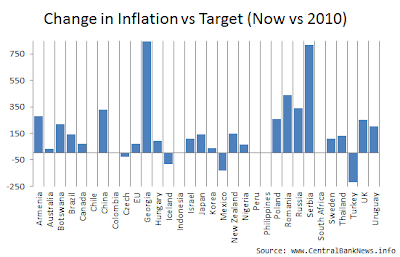 Of the 32 countries, 23 saw inflation go above target, or go higher above target, 4 saw inflation falling closer to target (2 fell into target range), while 5 saw inflation staying within target. So one of the key highlights of this report is that most countries saw inflation increasing compared to their target. This is consistent with trends observed in another Central Bank News report on interest rate adjustments, where of 79 central banks covered, 32 made net increases to interest rates. 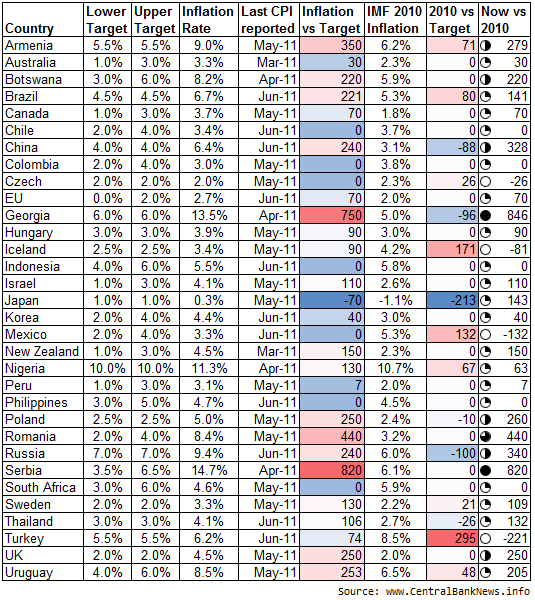 Central bankers in most countries have had to work harder this year to contain inflationary pressures. However there also remains a core of countries with low inflation pressures, which helps explain the 40 central banks that made no net changes to interest rates in the first half of the year. Much of the increase in inflationary pressures can be linked to the recent surge in commodity prices, with agricultural commodities driven up by structural pressures such as rising populations, and a string of adverse weather conditions which have impacted on supply. Energy prices have also been surging as cyclical pressures and geopolitical tensions have impacted on oil prices. Another factor has been relatively strong aggregate demand in emerging markets, with 18 of the 24 countries with inflation above target being emerging markets. Indeed most emerging markets have reported stronger GDP growth through the global economic recovery than their developed market counterparts, with many seeing the risk of overheating rising above the risk of maintaining growth. One thing for certain is that the growth vs inflation balance will become more complex during the second half of the year. Inflation targeting is an often cited goal of monetary policy, alongside other goals such as maximizing GDP growth, optimal employment, and financial stability. While there is some debate about the merits of inflation targeting, the benefits often cited of explicit inflation targeting include greater certainty and transparency of central bank interest rate decisions, price stability, and ultimately a lower neutral interest rate, provided inflation can be contained within a reasonable range. See the Wikipedia entry on inflation targeting for a summary of the issues and debate on explicit inflation targeting in monetary policy. Great summary. 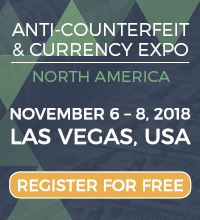 I believe that with the end of QE2 in the US will ease some inflationary pressures.